The X-Men #3, November 1963 | We've Got Some Issues. At this point (Issue 3), the X-Men’s central purpose seems to be to detect and locate other mutants and absorb them into their team or battle them. When Xavier senses another mutant nearby, he deploys his squad to find and then… I don’t know, capture? this new one. Xavier now needs, apparently, to “drive this memory from his mind.” So, after having sought out, finding and bringing Blob to their mansion, Xavier needs his team to physically arrest him so that he can give him the Vanisher treatment (Why Xavier could perform this feat from a distance on Vanisher and not on Blob is unexplained). 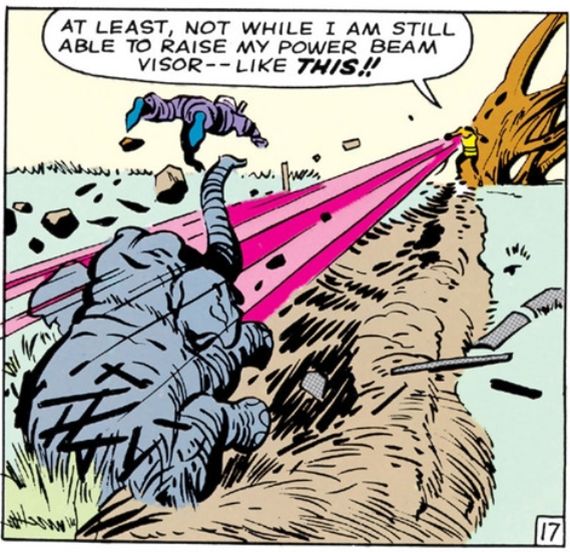 Blob escapes back to his circus where, now engorged with pride (“Heck, if the X-Men want me, I must be hot stuff!”) he assumes control of the circus and launches an attack on the X-Men. The next panels are a riot of circus freaks on mutant action. Beast fights a gorilla, Iceman swings a mop at a giraffe, etc. When the dust clears, Xavier saves the day again by wiping the Blob’s memory (this is precisely the same treatment the Vanisher received an issue ago). The episode ends with a promise that the Blob’s memory may return and with it his vengeance. And secondly, WTF, Xavier is in love with Jean Grey?! In a private thought bubble, Xavier agonizes, “As though I could help worrying about the one I love! But I can never tell her! I have no right! Not while I’m the leader of the X-Men, and confined to this wheelchair!” This shocker is never explained and no mention of it is made again in this issue. While this idea is more than vaguely lecherous and offensive to the Xavier legacy now, to an audience in 1963, reading about a new character and a new team, this would be a masterstroke. This provides the X-Men some cutting internal tension and serves as a big leap toward deepening this book and this team. 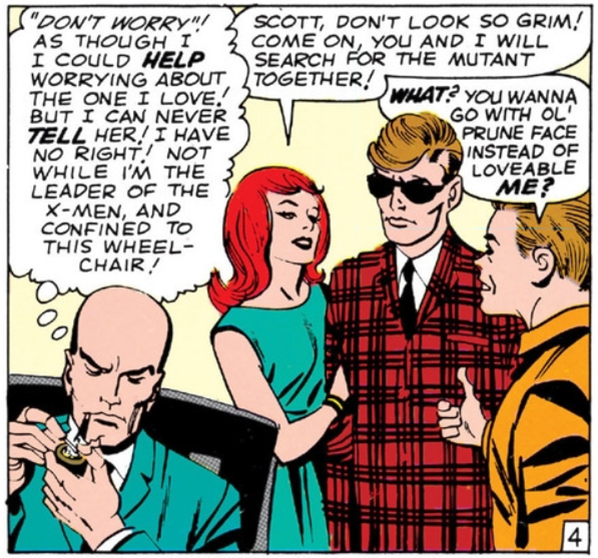 i can’t be in love with jean because i’m a leader and can’t take advantage of her….also i’m in a wheelchair.